I was lucky to book a flight, several weeks ago, out of Singapore for the Easter holiday weekend. Flights book solidly full months before a holiday, the cheapest flights going first. Since I was paying, I opted for economy class of course, but on Royal Thai, as on Singapore Air, economy is several notches better than in the states. The flight to Bangkok was only two hours, but they served a delicious small dinner – choice of fish or chicken – including wine. The next flight, to Chiang Mai, was even shorter – only an hour – but again there was food, this time a snack box with sandwich, fruit in gelatin, and a thick slice of cake (not quite as sweet as pound cake). Altogether, a pleasant dinner. Walking through the big airport in Bangkok, I knew it was Thailand when the immigration officers at passport control smiled and offered help. I’d like to find at least one other country where that happens. I made this trip alone since Nancy is still enjoying the USA. I had a couple of goals clearly in mind: Chiang Mai is a city of Buddhist temples – literally hundreds – and I wanted to go on an intense temple tour. Next, I wanted to go shopping; I wanted to find Thai silk and Buddhist art. Finally, I wanted to see whether I still enjoy self-guided exploration based on guidebook and serendipity, which usually involves wrong turns, blind alleys, and back tracking. The old Chiang Mai was a small walled city, surrounded by a moat. Before leaving Singapore, I studied the hotel reviews and picked one in the center of the city at the amazing rate of $60 per night, and I was pleasantly surprised that breakfast was also included. Better yet, the price did not include any additional tax, no tourist levy , no 20% surprise at checkout. And the room was air-conditioned for good sleeping. The Parasol Inn is somewhere between two stars and three – pleasant and clean if not ritzy. Carry your suitcases up the stairs because there’s no elevator. I’ve been in better and I’ve been in worse, but the location was fantastic, the staff was very friendly, the bathroom was basic but en suite, the hot water was adequate, and, with no outside window, no street noise. I did sleep soundly in a big bed. I was a little disappointed, at first, when I discovered that the old city is not the commercial district. The fancy stores (a few of them) and the high rises are all in the newer part of the city outside the old walls. Inside, only the temples are really old (some of them 500 years old), but almost all of the buildings are only two or three stories, so a spire or a temple roof is always in sight. When I arrived, in the early evening, the streets were very quiet with very little traffic. Not so the next morning. Even though it was a Thai public holiday, a constant stream and roar of cars, buses, tuk-tuks, motorcycles, and bicycles, all jostled and rushed toward the next light or around the next corner. Buses are really converted pick-up trucks, with a roofed bed over two rows of hard benches. 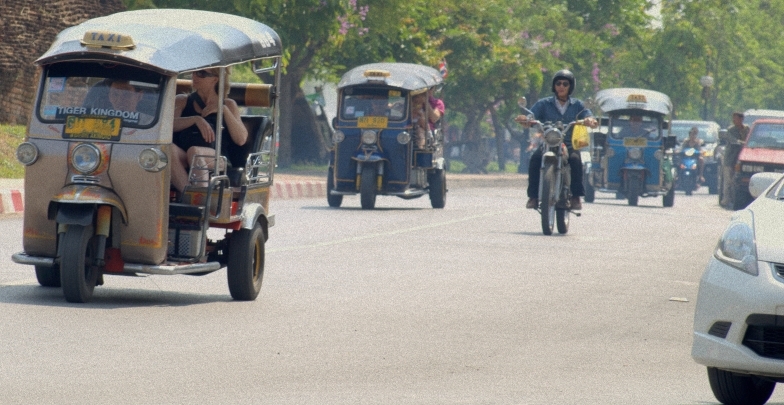 Tuk-tuks are three wheeled vehicles, driver in front, passengers in a single seat behind, weaving through the other traffic at top speed, looking for every possible position advantage, and diving into any open space, almost no matter how narrow. Motorcycles edge their way to the front of all the traffic stopped at a light; when the light changes they race away like a swarm of bees, vying with each other to be the first into the intersection. The streets of Chiang Mai are not for the faint of heart, and you take your life in your hands when you cross, even at a corner with a green light. Stay alert, stay light on your toes, and be prepared to scamper. Some of the walls of the city remain, but most of them were torn down in the WWII to use the bricks for road building. Outside the walls, the old moat remains. One road rings the city inside the walls, one-way counter-clockwise; another rings the city, clockwise, outside the moat. No lights slow the traffic from racing continuously, ferociously. Entering the traffic from a cross-street is an art form in which a driver spies the tiniest break in traffic, and with exquisite timing, guns his engine, turns very sharply into the lane, manages to squeeze in without breaking the flow, and miraculously avoids a collision. 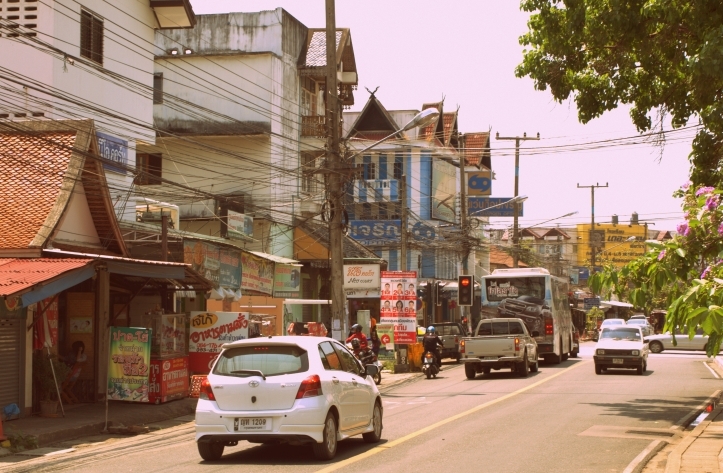 The streets are one shot of adrenalin after another but no road rage – it’s Thailand. Drivers are calm and peaceful (it must be genetic!) smiling or laughing, even as they flip off someone for unexpectedly (yes, mysterious rules and expectations, somehow govern this swirling chaos) cutting them off. A real adventure! Enjoyed the pictures!